Curls are divine! 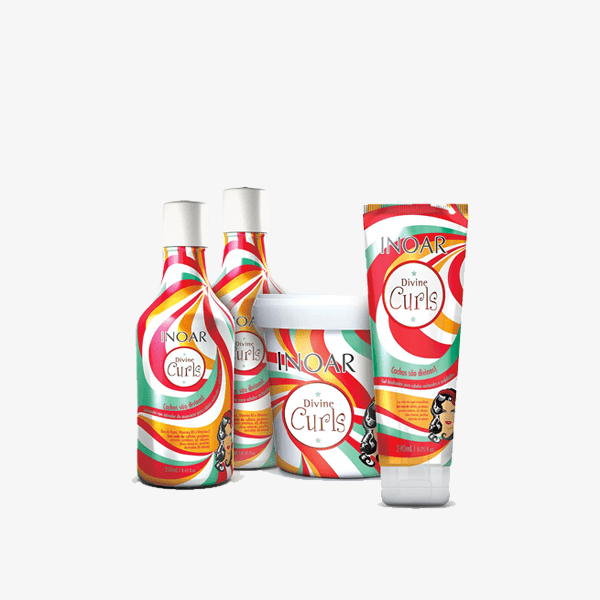 Inoar Divine Curls was made this way for who has curls – and for you to not even think of living without them. Curls are divine! Inoar Divine Curls was made this way for who has curls – and for you to not even think of living without them. Composed of Shampoo without accumulative ingredients, Conditioner, Mask and a Finishing Gel for Curls, it cleans in the right measure and hydrates the hair without weighting, keeping the memory of the curls for hours thanks to the active ingredient extracted from the golden flax seed, making them flexible and frizz-free, ready to move around. The line has products that clean in the right measure and hydrate the threads without regret, keeping the memory of the curls for hours, thanks to an active extracted from the golden flax seed, with flexibility, and without frizz, ready to move around. Low Poo Shampoo, without cumulative ingredients, with Pequi Oil, Vitamin B5 and Vitamine E. All products are free from sulfates, parabens, synthetic dyes, salt, silicones, mineral oils, paraffin and animal derivatives. Natural and lasting curls with frizz reduction. Apply Divine Curls Conditioner, involving strand by strand, always activating the curls. Let it stand for 3 min. Rinse it completely. Remove excess water with towel or cloth, scrunching from tips towards the root. On a weekly basis, apply Divine Curls Mask, involving strand by strand, scrunching from tips to root to activate the curls. Rinse completely and remove excess water with towel or cloth, scrunching from tips to root to activate the curls. With damp hair, spread an average amount of Divine Curls Finishing Gel. From the bottom to the top, scrunch the hair to form the curls. Finish with hair diffuser or let it dry naturally.